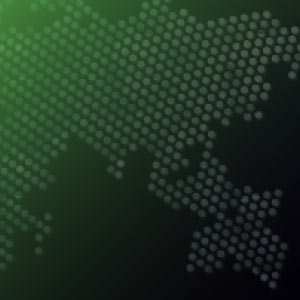 This post is part of Gallup's ongoing series on the shifting landscape for financial institutions. It provides insights into channel optimization, emerging customer behaviors and preferences, product penetration and relationship growth, engaging the most critical affluent and business customers, and reshaping banks' overall value proposition. Gallup recently asked more than 6,000 banking customers the following, "If you had to give up one aspect of your relationship with your bank, the digital (you would no longer be able to interact with your bank through mobile or online channels) or the personal (you would no longer be able to visit a branch or call a call center), which one would you give up?" The results slightly favored digital banking, with 47% of customers saying they would give up their digital relationship and 53% saying they would give up their personal banking relationship. We then asked customers if their current banking relationship was mostly digital or mostly personal in nature, and if they would prefer their current relationship to be mostly digital or mostly personal. Sixty-two percent of customers had a preference match -- that is, their current relationship is as much digital or personal as they want it to be. But for the 38% who did not, the effect on their engagement with their bank was profound. 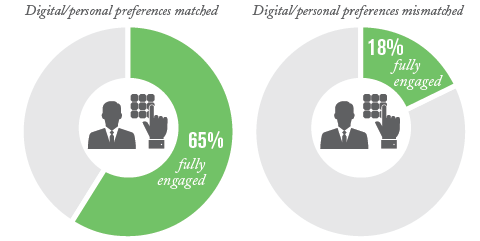 Customers who wanted a personal relationship but who had a digital one (or vice versa) were less likely to be fully engaged with their bank by 47 percentage points than those whose preferences matched. Not meeting customers where they want to be leads to disengagement -- and has a serious impact on a bank's bottom line. Given the amount of time the industry spends talking about moving everything to digital, it is easy to think that to better engage our customers we must keep evolving digital at the expense of everything else. And yes, it is true that digital channels must continue to evolve, both from a customer experience perspective and from an internal bank IT and operations perspective. But if we dig a bit beyond the sensationalized headlines that even I am guilty of writing to get your attention for this article, a more nuanced picture emerges. Of those 32% of customers who have a channel preference mismatch, 19% (on each side) think that their relationship is currently too digital or too personal. When we drill down just to the preference data, we find a clear slant toward digital, but still, only 11% of people would prefer their relationship to be exclusively digital. The truth is that most people use multiple channels, with the plurality using three to four. Given the nature of how people manage and use their money today, this makes sense. For example, in the last three months, 78% of people have withdrawn cash from an ATM, 71% have made a bill payment through online banking, and 21% have deposited a check through a mobile app using Remote Deposit Capture (RDC), while 65% have deposited a check in person at a branch. Personal preferences certainly play a role in how customers choose to interact with their bank, but given where we are today, it can take more effort for a person to have a totally digital or totally personal relationship with their bank than to just do what it easiest for them at the time. While millennials will continue to drive channel use and transactions more toward digital (I can imagine a day when the deposit a check by RDC and deposit a check in a branch numbers are reversed), they also haven't had or are just starting to have the life experiences (buying a house, having kids, helping with aging parents, etc.) that generally make people either want to use personal channels or have no choice but to use personal channels. So banks, what does this all mean for you? What's the bottom line? In this multichannel world, you need to be perfect in every single interaction with customers -- every single time. You need to let customers interact with you through the channels they want -- digital or personal -- but you must also go out of your way to ensure a satisfying customer experience in each of those channels. Engagement drops when customers don't interact with their bank in the way they want to, but it also drops -- by 40% -- when they give a less-than-perfect satisfaction score to even one of the channels they use. Banks must focus on the holistic customer experience. Yes, it is way more complicated than in the days when people only had to interact with a branch and everyone knew their name. This approach is more complicated than creating a service program for only one branch, adding new features to online banking, simply launching a mobile app to say you have one, or putting out a new rewards program for a credit card. But to create fully engaged customers, and reap the financial benefits that come with them, banks have no choice but to embrace this complexity and keep moving forward into the new frontier. Daniela Yu contributed to this article. The banking industry looks much different now than it did just 5 1/2 years ago when the Great Recession ended. The consumer's experience and technology are more of a focus now than ever, but many banks still struggle with their most basic operations, leaving these organizations with a long -- and sometimes competing -- list of priorities. 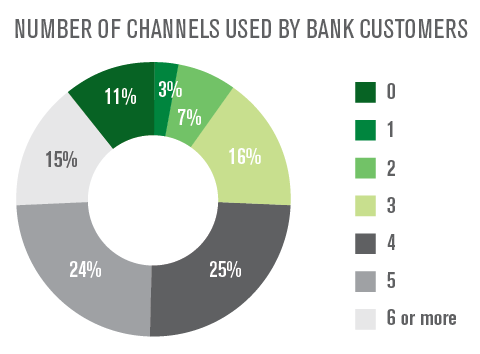 When customers use person-to-person service channels, it costs banks more. Here are three tactics to get them to switch to less expensive digital options.